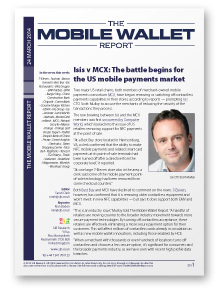 In this edition of The Mobile Wallet Report we examine: Isis v MCX — The battle begins for the US mobile payments market: 7-Eleven and Best Buy, both members of MCX, are reported to be removing contactless payments terminals from their US stores, prompting Isis CTO Scott Mulloy to accuse the merchants of reducing the security of … Continue reading "The Mobile Wallet Report, 24 March 2014"
The post The Mobile Wallet Report, 24 March 2014 appeared first on SJB Research. 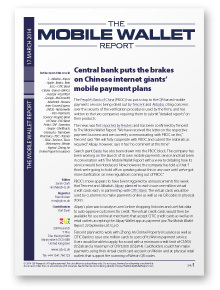 In this edition of The Mobile Wallet Report we examine: Central bank puts the brakes on Chinese internet giants’ mobile payment plans: The People’s Bank of China (PBOC) has put a hold on the QR-based mobile payments services being rolled out by Tencent and Alibaba, citing concerns over the security of the verification procedures used by the … Continue reading "The Mobile Wallet Report, 17 March 2014"
The post The Mobile Wallet Report, 17 March 2014 appeared first on SJB Research. 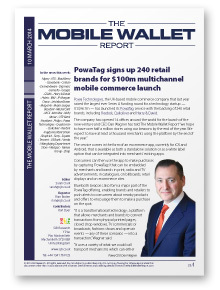 In this edition of The Mobile Wallet Report we examine: PowaTag signs up 240 retail brands for $100m multichannel mobile commerce launch: “We hope to have over half a million stores using our beacons by the end of the year,” Dan Wagner, CEO of the UK-based mobile commerce company that last year raised the largest ever Series … Continue reading "The Mobile Wallet Report, 10 March 2014"
The post The Mobile Wallet Report, 10 March 2014 appeared first on SJB Research. In this edition of The Mobile Wallet Report we present an eight page special report on a new tokenization framework being developed by EMVCo at the request of Visa, MasterCard and American Express. 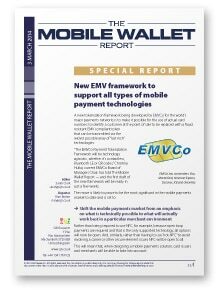 Around a wide ranging interview with the chair of EMVCo’s board of managers, Christina Hulka, we set out why this addition to … Continue reading "The Mobile Wallet Report, 3 March 2014"
The post The Mobile Wallet Report, 3 March 2014 appeared first on SJB Research. 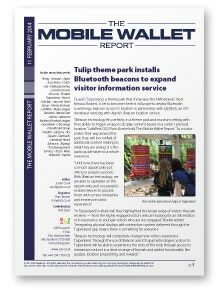 In the latest edition of The Mobile Wallet Report we examine: Tulip theme park installs Bluetooth beacons to expand visitor information service: iBeacon technology “will completely change how visitors experience Tulpenland”, technology provider LabWerk’s Floris Boekel tells The Mobile Wallet Report. Starbucks CEO to take charge of next gen payments initiative: “We are just beginning to appreciate … Continue reading "The Mobile Wallet Report, 11 February 2014"
The post The Mobile Wallet Report, 11 February 2014 appeared first on SJB Research. 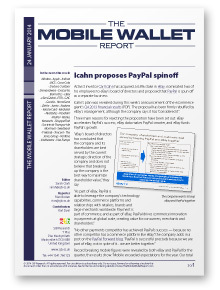 In the latest edition of The Mobile Wallet Report we examine: Icahn proposes PayPal spinoff: Activist investor Carl Icahn says PayPal should be split off from eBay as a separate business, but management has three reasons why the two should stay together. MasterCard explains its plans for remittances: “We are going to offer a broader set of … Continue reading "The Mobile Wallet Report, 24 January 2014"
The post The Mobile Wallet Report, 24 January 2014 appeared first on SJB Research. 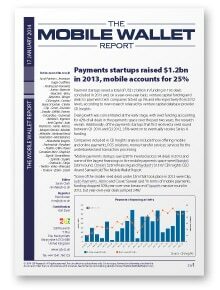 In the latest edition of The Mobile Wallet Report we examine: Payments startups raised $1.2bn in 2013, mobile accounts for 25%: 94 mobile payments startups raised a total of $287m last year, CB Insights CEO Anand Sanwal has told The Mobile Wallet Report. Accel Partners and Andreessen Horowitz were the most active investors. Jordan preps national mobile … Continue reading "The Mobile Wallet Report, 17 January 2014"
The post The Mobile Wallet Report, 17 January 2014 appeared first on SJB Research. 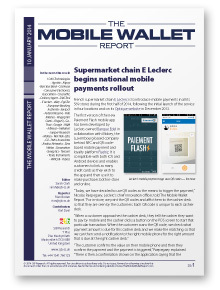 In the latest edition of The Mobile Wallet Report we examine: Supermarket chain E.Leclerc begins national mobile payment rollout: All 569 of the French chain’s supermarkets will accept payments via the retailer’s own QR-based mobile payment app by mid-2014, chief innovation officer Nicolas Paepegaey tells The Mobile Wallet Report. InMarket rolls out Bluetooth beacons to US grocery … Continue reading "The Mobile Wallet Report, 10 January 2014"
The post The Mobile Wallet Report, 10 January 2014 appeared first on SJB Research. 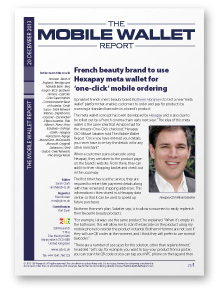 In the latest edition of The Mobile Wallet Report we examine: French beauty brand to use Hexapay meta wallet for ‘one-click’ mobile ordering: Biotherm Homme is to test a new “meta wallet” platform that enables customers to order and pay for products by scanning a standard barcode on a brand’s product. Eftpos Australia trials cloud-based mobile payments: The … Continue reading "The Mobile Wallet Report, 20 December 2013"
The post The Mobile Wallet Report, 20 December 2013 appeared first on SJB Research. 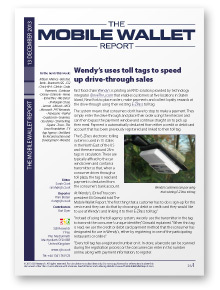 In the latest 12-page edition of The Mobile Wallet Report we examine: Wendy’s uses toll tags to speed up drive-through sales: Technology provider iDriveThru.com’s president Eli Grinvald explains how the fast food chain’s customers on Staten Island can use their existing EZ-Pass toll tag to avoid stopping to make a payment. The Internet of Things gets closer: Jim Zemlin, … Continue reading "The Mobile Wallet Report, 13 December 2013"
The post The Mobile Wallet Report, 13 December 2013 appeared first on SJB Research.